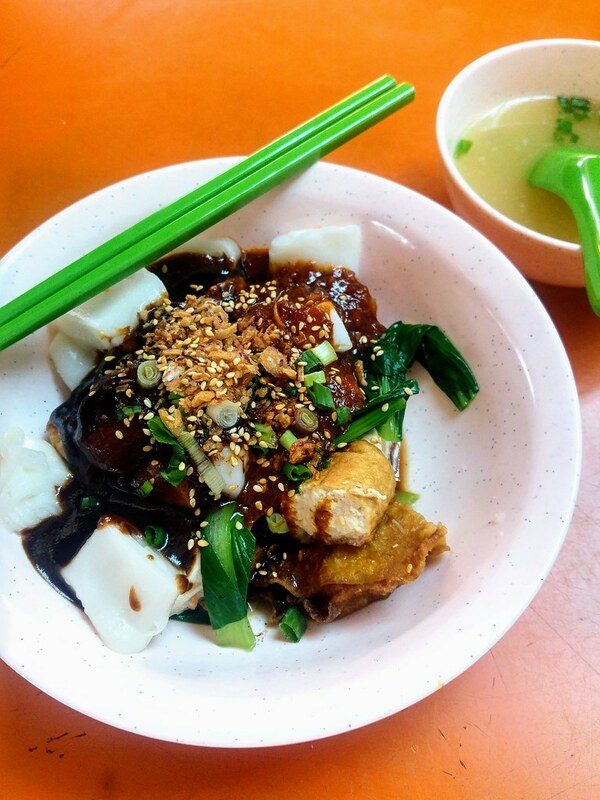 Maxwell Hakka Handmade Yong Tau Foo has recently set foot at Maxwell Food Centre, specialising in Hakka style Yong Tau Foo. Ingredients are handmade, notably their special fish paste with carrot slices and the soup broth prepared with pork bones, radish, ikan bilis and soy beans. One look at the ingredients stuffed with their special fish paste and you will know they are indeed different from the commercial 'snowwhite' version. They are prepared fresh daily to ensure quality, mostly done by the owner, Vincent himself with a bit of help from his aunt on weekdays and co-owner Alex will be around on weekends to share the load as well. He learnt the skills from his uncle and took him about a year before coming out on this own. Although stories of giving corporate jobs and switching to hawkerpreneurship are not new these days but they are still very much inspiring to listen to, especially when it is not big and fancy about dreams and what not, but very much rooted to changing a source of livelihood, like how hawkers started off back then. I also like to see how their loved ones root for them and support them in different ways. Kindness makes the world go round. Back to the food. Another key aspect of Yong Tau Foo is the sauces. 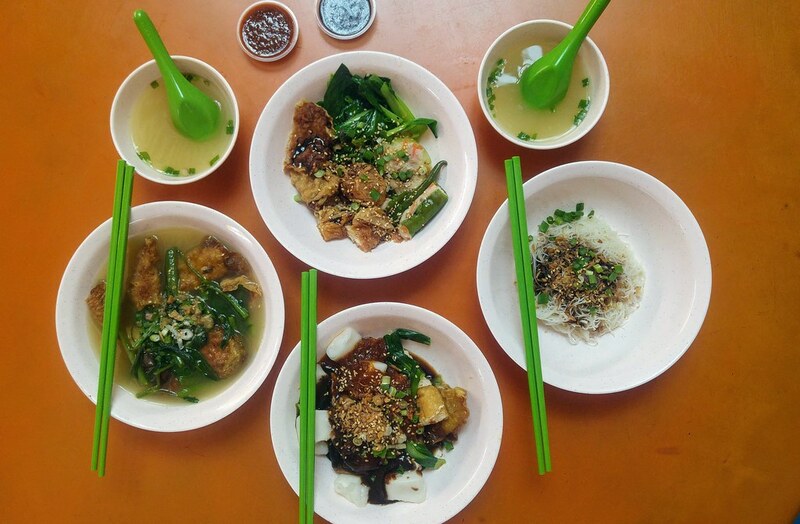 At Maxwell Hakka Handmade Yong Tau Foo, their chilli sauce and sweet sauce are concocted with their own recipes as well, including the sesame oil drizzled on the dry Yong Tau Foo. The most popular item here that often gets sold out is the freshly steamed Chee Cheong Fun Yong Tau Foo ($4) and I can see why is that so. The chilli and sweet sauce go naturally well with chee cheong fun and when served alongside with other ingredients. This bowl of 'chunky' ingredients of different textures and bites is quite satisfying to eat. 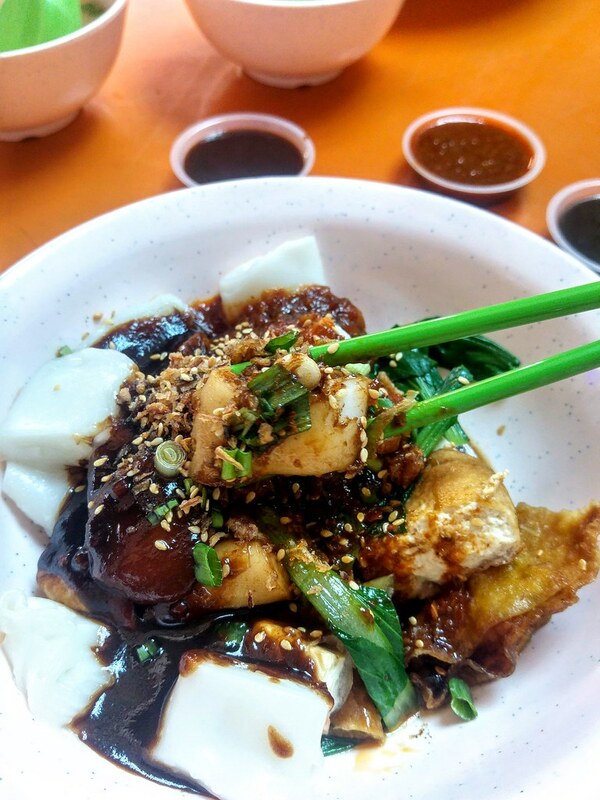 I would imagine for somebody who often have chee cheong fun as breakfast or snack, this is a perfect combination for a brunch. And for such a hearty bowl, it is only $4. 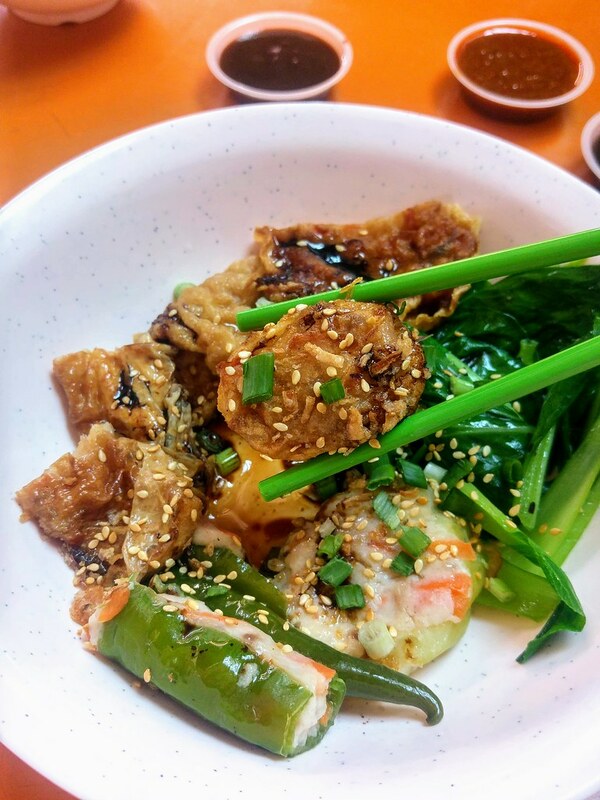 The Dry Yong Tau Foo comes with their special sesame oil, giving a dash of flavour to the plain Bee Hoon. Hence, I do suggest having your bee hoon or noodles at the side for the extra enjoyment. One of Alex's own creations is the Fried Egg in which he halved the egg, laid the fish paste and fried it. The usual ones would be frying the entire egg without any stuffing, this definitely takes more effort. The soup here is really tasty - light but has the depth and sweetness. 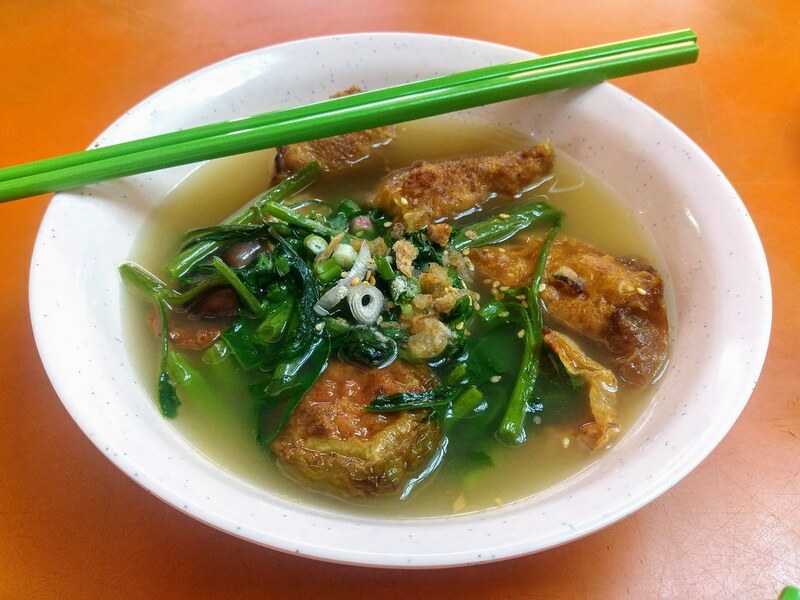 Hence the Yong Tau Foo Soup ($3.80) is what I will go for. 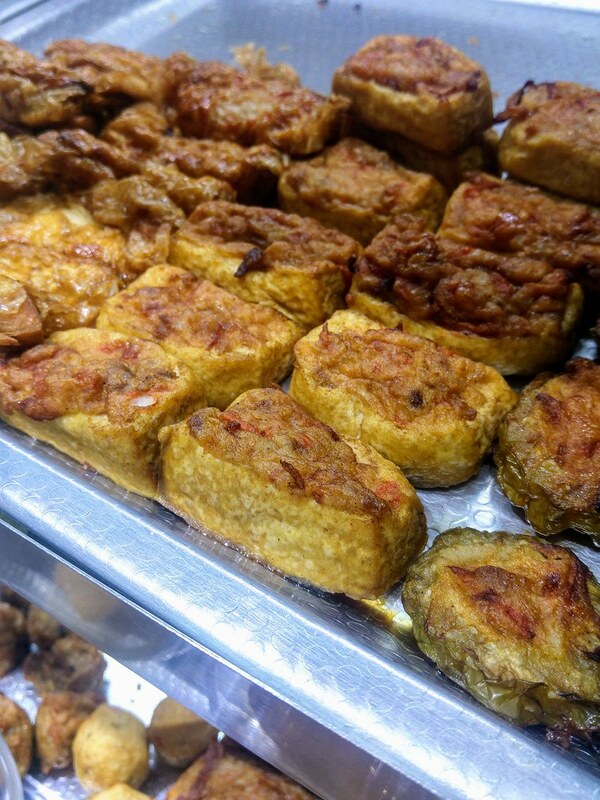 As for the ingredients, I enjoy both the non-fried and fried beancurd with fish paste, as well as the brinjal and bitterguord. The sliced carrots in the fish paste stood out in most of the ingredients, adding texture and sweetness to the well seasoned stuffing. Both the brinjal and bittergourd could be better if they were of thicker slices. One could appreciate the fish paste more as the ingredients tend to shrink and get abit oily when fried. The Green Chilli YTF is quite yummy too, as the sweetness of the carrot does help to ease the sharpness of the chilli. 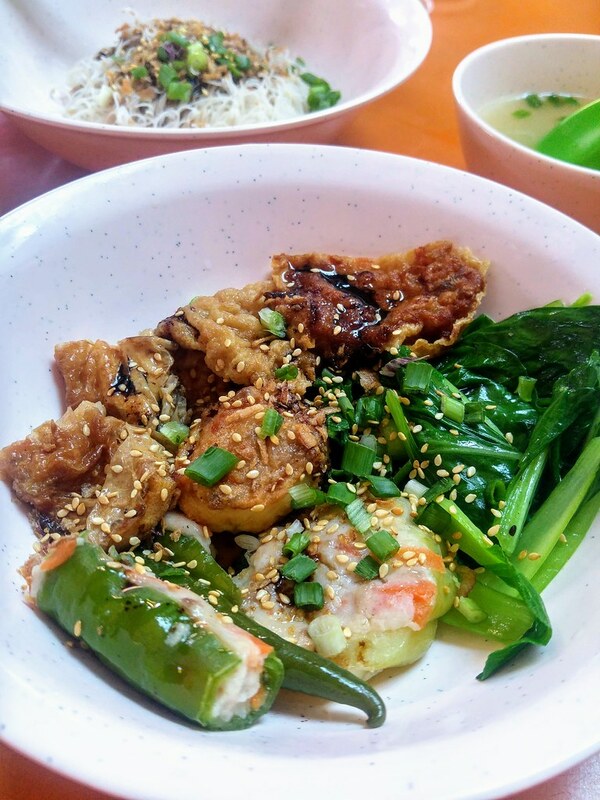 Growing up eating my mum's Yong Tau Foo and seeing her making each ingredient from scratch, like any hawker dish, dishing out a bowl of a decent Yong Tau Foo is not easy. They have done a pretty good job, with quality ingredients and conviction to get it right. 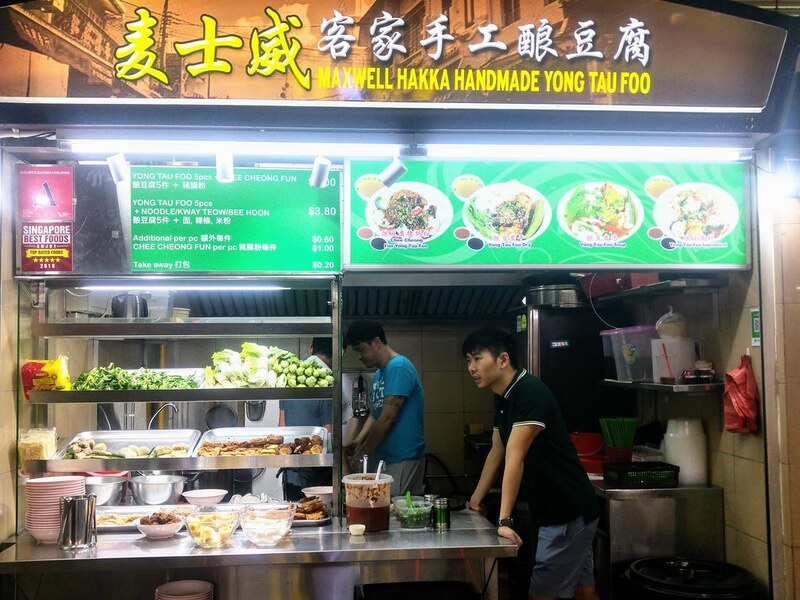 Maxwell Hakka Handmade Yong Tau Foo is quite secluded at the last row near to the construction side hence do keep a look out for it if you often get your lunch from Maxwell Food Centre. They are open on weekends too.